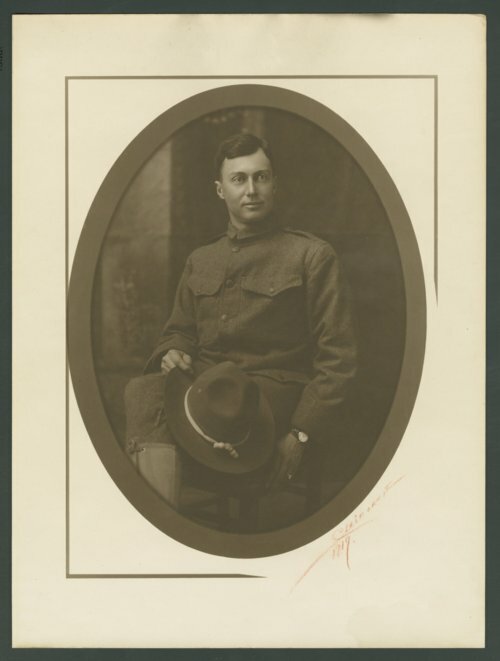 This is a photograph of Dana Loyd Dunaway dressed in his World War I uniform. He was born October 18, 1887 in Osawatomie, Kansas to William Love Dunaway and Mary J. Dunaway. In 1912, Dunaway was working for the Missouri Pacific in Osawatomie as a timekeeper when he met his future wife Eva Powell who was a clerk for the railroad. They were married in 1915 in Osawatomie. In 1917 Dana registered for the draft and entered the Army that same year. In the 1930 federal census Eva and Dana Dunaway were listed as owning a house in Osawatomie. He died August 20, 1961 and is buried in Elmdale Cemetery. Eva died in 1965 and is buried next to her husband.